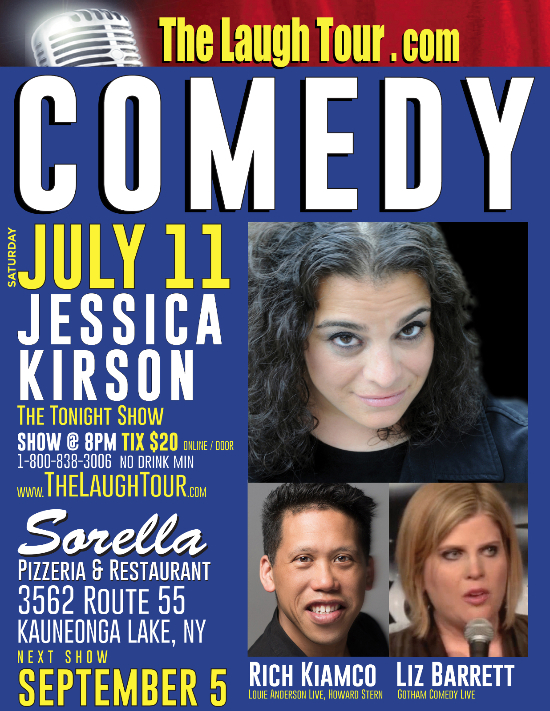 KAUNEONGA LAKE, NY (July 6, 2015) – The Laugh Tour starring Jessica Kirson from The Tonight Show, The View, Celebrity Apprentice, Comedy Central, Last Comic Standing, VH1, Oxygen, Montreal Just For Laughs Festival, returns to Kauneonga Lake on Saturday, July 11 at Sorella’s at 3562 State Route 55. The comedy line-up also features Liz Barrett from Gotham Comedy Live and host Rich Kiamco from Louie Anderson-Live, Las Vegas. Jessica’s unique style and powerful stage presence captures the attention of audiences everywhere she performs. She’s received the MAC Award for Best Female Comic in New York City. She was selected to perform at the Hamptons, Toyota, Marshall’s Women in Comedy, and Las Vegas comedy festivals. She has been featured on Comedy Central’s Premium Blend, Nickelodeon’s Sixth in the Suburbs, Noggin’s LOL, VH1’s Awesomely Bad Hair, Awesomely Bad Love Songs, Oxygen’s Can You Tell?, Bravo’s The Great Things About Being, The Women’s Television Network’s She’s So Funny, NBC’s Last Comic Standing, Seasons 2 + 3, Last Call With Carson Daly, regular appearances on The Joy Behar Show, and two appearances on The Tonight Show. Liz Barrett is a deadpan comedian who is just "Gettin’ By" in this crazy world. Her one liners come fast and furious and is often called a female Bob Newhart. Formerly a lawyer who quit that jungle for comedy, she was a runner up in the Ladies Of Laughter Contest and a finalist in the She Devil Comedy Festival. Barrett recently made her television debut on Gotham Comedy Live on AXS TV. Host Rich Kiamco has been seen on Howard Stern, Boston Comedy Festival, San Diego Comedy Festival. Rich’s comedy career began as the costume designer for comedian Judy Tenuta where he eventually began performing with her as her back-up dancer in Las Vegas, on The Howard Stern Show and venues nationwide. He received the Overall Excellence Award at the NY Fringe Festival + Best Solo Performance at the Montreal GLBT International Theatre Festival and has performed on campuses and venues across the USA, Canada, China and the Philippines. Rich was featured on BRAVO’s Queer Eye For The Straight Guy, has had multiple appearances on OutQ Sirius XM Satellite Radio, appeared on the Wendy Williams Show, performed in the Boston Comedy Festival & San Diego Comedy Festival and recently opened for Louie Anderson in Las Vegas. paperless ticketing, your name is held at the door, open seating. Please note that a limited menu is available for dining during the show, and it is strongly suggested that you call the venue at 845-583-4300 to make dinner reservations to eat before or during the show. Comedy traffic was heavy at the previous show, so additional staff has been added.